Dating back to the 1930s, Midget Car racing is the oldest form of oval car racing in the UK, but the formula has come a long way since those days. Back in their formative years GP Midgets were just that â€“ little replicas of the contemporary Grand Prix cars of the day, and they often raced in speedway style team matches. Nowadays the cars are highly specialised and powered by a variety of high-revving engines which give these little rocket ships incredible acceleration and demand plenty of skill from their drivers. Some have even claimed that these machines can out-accelerate a National Hot Rod. The Grand Prix Midget Club designs the rules of the formula to be as cost-effective yet enjoyable as possible and organises a large variety of annual trophies. The 2015 World Championship takes place in August at Foxhall Heath Stadium, Ipswich. 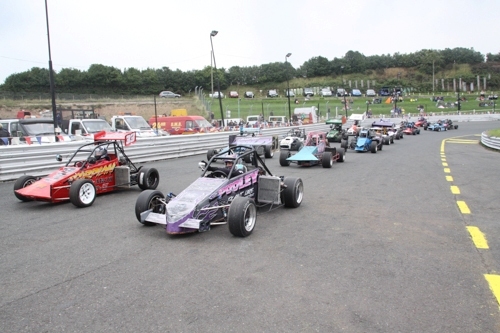 The formula is also a major part of the Birmingham Wheels Raceway I-Factor Fast and the Furious series of meetings.